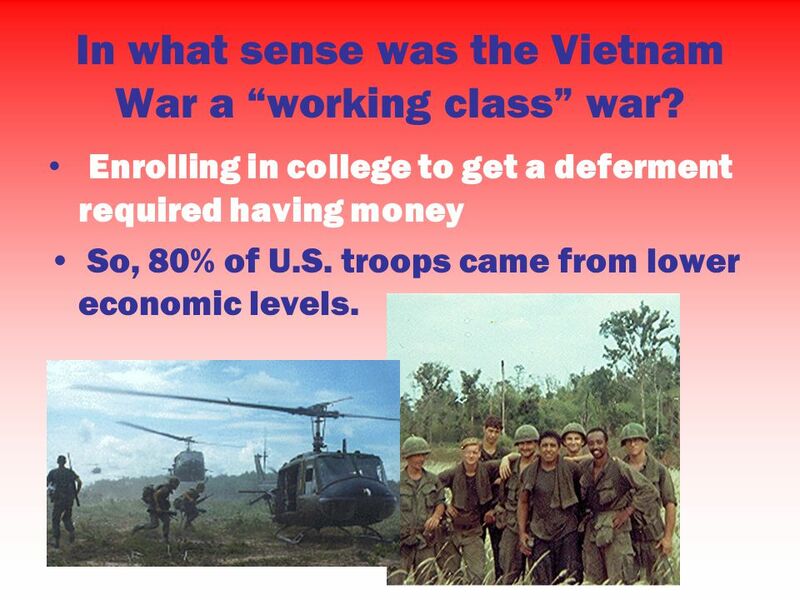 3 In what sense was the Vietnam War a “working class” war? Enrolling in college to get a deferment required having money So, 80% of U.S. troops came from lower economic levels. 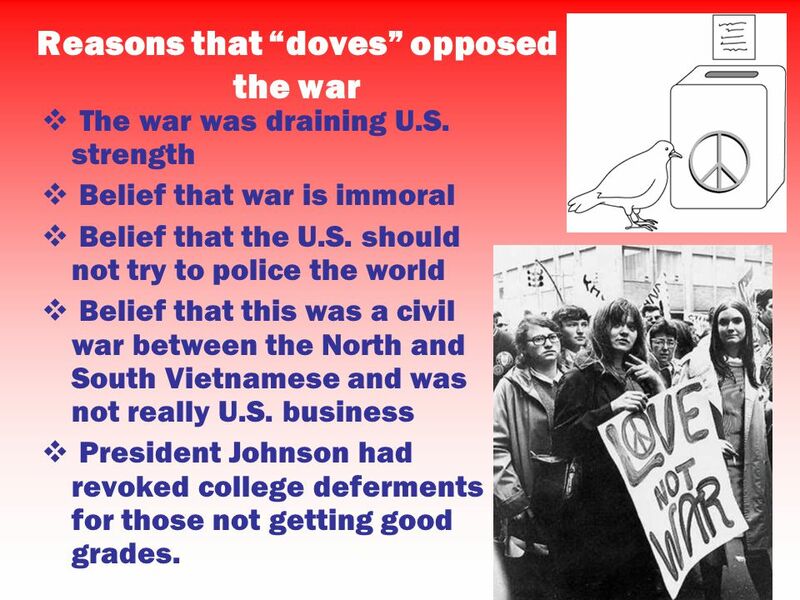 The war was draining U.S. strength Belief that war is immoral Belief that the U.S. should not try to police the world Belief that this was a civil war between the North and South Vietnamese and was not really U.S. business President Johnson had revoked college deferments for those not getting good grades. 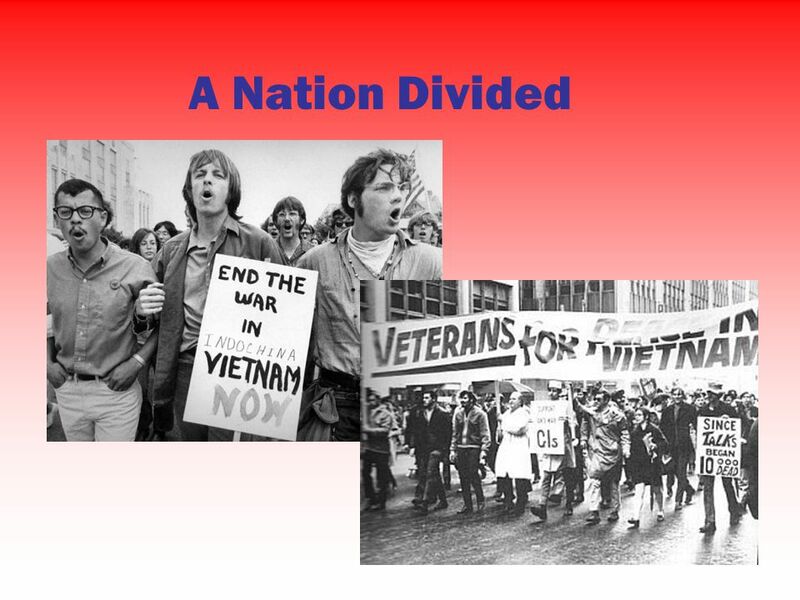 7 Defending the War By 1967: Most Americans supported U.S.
Download ppt "A Nation Divided." The War at Home Chapter 22 Section 2. A NATION DIVIDED CHAPTER 30, SECTION 3. A Nation Divided. 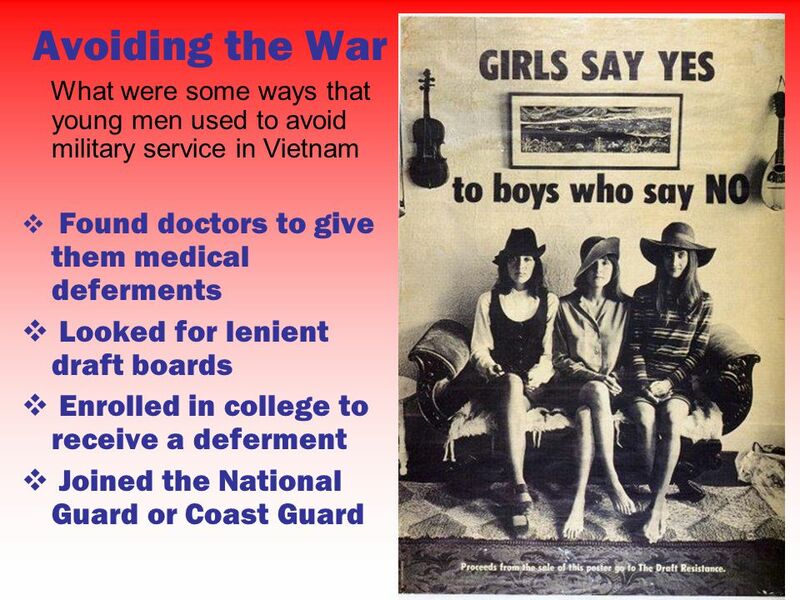 The draft A “very manipulated system”  How to dodge the draft: Sympathetic docs Lenient draft boards Natl Guard/Coast Guard College. 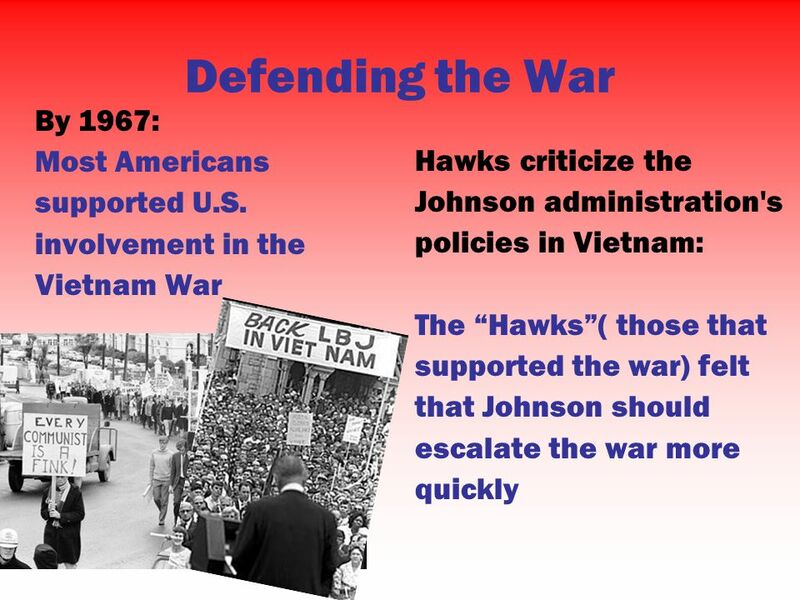 Vietnam War and the 1960s. 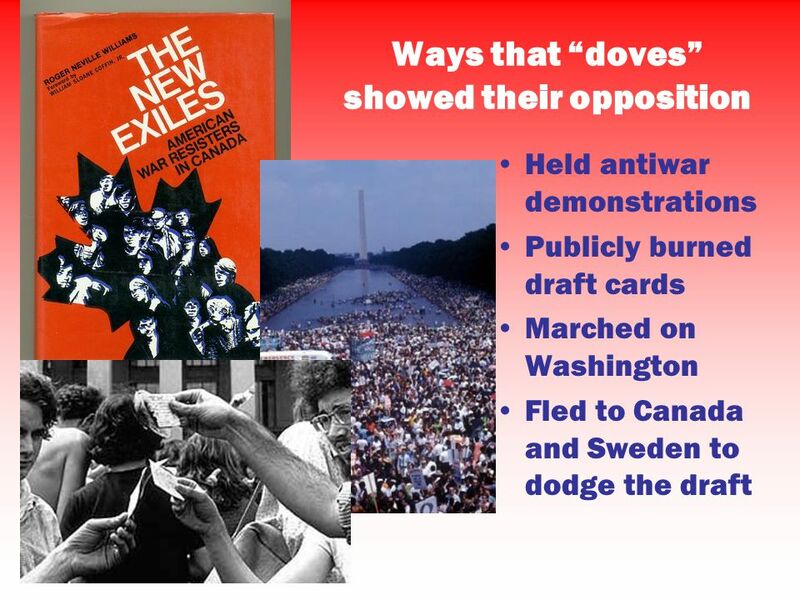 How did protests against the Vietnam War develop?. Anti-War Movement By: Mark Stucke and Jeffrey Becker. THE ANTI-WAR MOVEMENT BY: MELANIE COLES AND MARYMEGHAN YOUNG. Power Presentations CHAPTER 30. Image America in the World You are a young person in Your country is at war to stop Communists from taking over. THIS IS With Host... Your Vietnam Conflict? EscalationLeadersProtestsNixon’s Vietnam Vietnam Misc. A NATION DIVIDED A NATION DIVIDED CHAPTER 30, SECTION 3 CHAPTER 30, SECTION 3. 31.3 Student Protest Angela Brown Chapter 31 Section 3 1. Do Now: Why was the Vietnam War known as the "Living Room War"? What effect did the war have on the soldiers? The civilians back home? The Vietnamese? Vietnam: US Involvement. Vietnam’s History French Indochina Revolts  Ho Chi Minh – Indochinese Communist Party WWII  Japan  Minh returns to form Vietminh. Vietnam Divides the Nation. The American commander in South Vietnam, General William Westmoreland, reported that the enemy was on the brink of defeat. 22.3 THE WAR DIVIDES US. 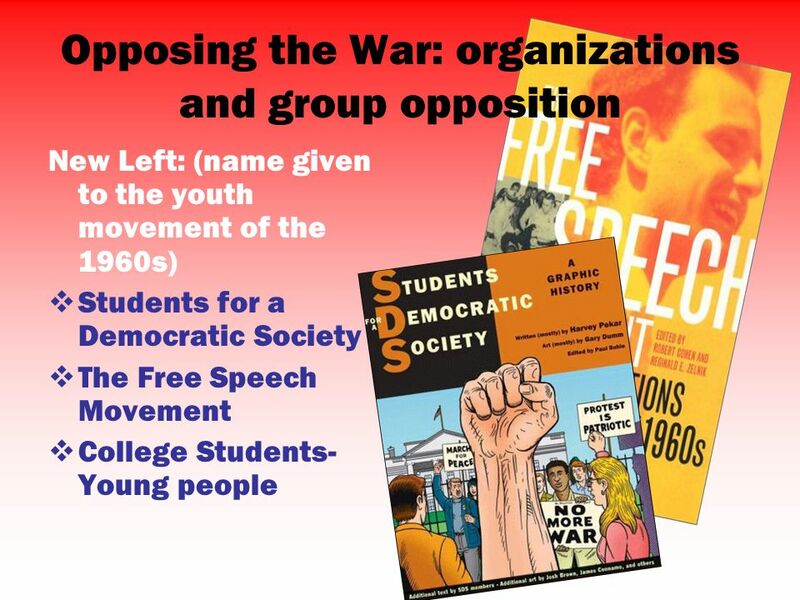 “A HOUSE DIVIDED…” Students for a Democratic Society (SDS) sprang up on college campuses Wanted political and economic reforms.